If you liked ArtStudio on the iPhone, just think of the iPad version of the mobile creative tool as giving you more room to explore your creativity. 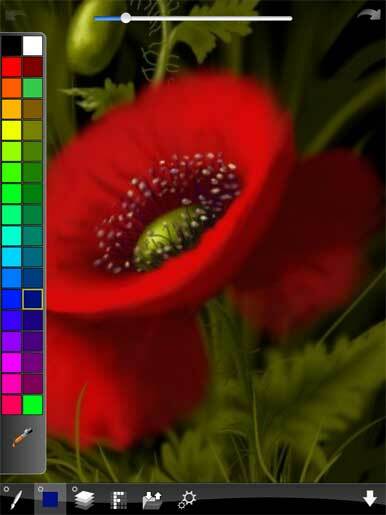 Lucky Clan has swiftly adapted its ArtStudio drawing and painting iPhone app for the iPad’s large screen. The interface in ArtStudio for iPad remains much the same as the original iPhone and iPod touch offering, with many brushes, drawing modes, touch navigation, unlimited zoom, and more. Work freehand or with your own photos to give them elegant effects. If you already know your way around a sketchpad or easel, you can just tap and swipe your way through the program’s features. The app gives you 25 brushes, including pencils, brushes, eraser, smudge tool, bucket fill (in simple and smart mode), glow, tube, airbrush, and more. Along with that, simulated brush pressure, multi-touch navigation, and zoom give you lots of flexibility to create your picture. Sophisticated options such as line smoothing, antialiasing, zooming, and filtering give experienced users some variety. Advanced settings offer multiple parameters and real-time brush previews. Effects like blur, sharpen, and Sepia, plus advanced color editing with customizable swatches, offer creative latitude. If you like the result, you can export the image to your iPhone gallery or e-mail your picture. And if you don’t like the result, there are six levels of undo and redo. ArtStudio’s interface is created for both beginners and advanced artists. The screen can be displayed in simple or advanced mode. It even lets you work in layers with options such as add new, delete, reorder, duplicate, merge, clear, transparency, and visibility. Are you a beginner who can’t draw a straight line even with a finger tip? No problem: built-in drawing lessons provide step-by-step instructions on how to draw people, animals, perspective, and 3D. Lucky Clan is now selling the new iPad app in the App store for $1, an 80 percent discount from the iPhone app price tag of $4. Those who purchase now will get free upgrades forever, according to the developer. The product requires an iPad running iPhone OS 3.2 or later.